As I have mentioned before I did not use cloth diapers with Sadie. After doing some cloth diaper reviews with my mommy friends and hearing and seeing my sister prepare for her cloth diaper days soon to be, I have learnt that they really aren’t that bad and they have come along way in the past 20 years. BUT I still lingered at the fact of washing them and cleaning them everyday. My sister told me about this sprayer she seen on Ebay and I looked into it for her and was excited to get a review from The Potty Pail. This makes way more sense to me now and has eased my mind about the inconvenience of cloth diapers and all the extra work. After receiving the Potty Pail Sprayer we hooked it up and both stood back and smiled. It was like Angels singing in the sky…YAHOO!!!! 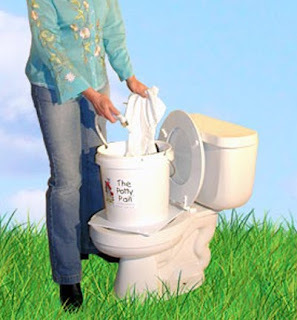 The Potty Pail fits on all standard toilets so no plumbing is required. However if you do get stuck and need help they have 12/7 (8-8) on call via phone or email. The Diaper Sprayer also features a No Burst toilet supply line by Fluid Master which means your sprayer will be worry free for years to come. Hand made in the USA, easy to use and easy to install. You can buy the Sprayer at www.pottypail.com for $39.95. You can also get the On the Toilet Sprayer Pail that goes with the sprayer for $32.95 or both for $ 59.95. The Pail has a drain hole with stopper, diaper drip hooks and a hose rest. So if you weren’t quite there with the whole cloth diaper thing like me…this system will help you get there and make things a whole lot easier for doing something a whole lot better for you, your baby and the earth. Receive $5 off the Potty Pail Sprayer and/or $10 off the Complete Potty Pail System. To take advantage of this special offer, please email the company at [email protected] before purchase and mention the Simply Stacie giveaway.